WOONSOCKET, R.I. – Valley Talks, a series of free historical lectures, continues on Sunday, Feb. 24, 1:30 pm, at the Museum of Work & Culture. Rhode Island Reds Heritage Society President Buster Clegg will present a screening of “When the Reds Ruled the Roost,” a documentary featuring the 50-year hockey love affair between Rhode Island’s former professional hockey team and its thousands of passionate fans. The film includes rare game footage and photos and film of Hall of Famers Milt Schmidt, Johnny Bower, Ed Giacomin, Fern Flaman, and legendary players including Chuck Scherza, Zellio Toppazzini, and Jim Bartlett. The screening will be followed by a Q&A with Clegg. The talk is presented as part of the Rhode Island Historical Society’s 2019 programming theme Rah-Rah Rhody, a celebration of sports in the Ocean State. Please note that Clegg’s appearance represents a programming change; the original event was to include Mount Saint Charles Hockey coach Dave Belisle, but he can no longer participate. Seating is limited to 75 and is first come, first served. A Rhode Island native born and raise in Burrillville, Clegg grew up playing hockey. He was part of the Broncos’ state championship team in 1955 and was selected as second-team All-State defense man. 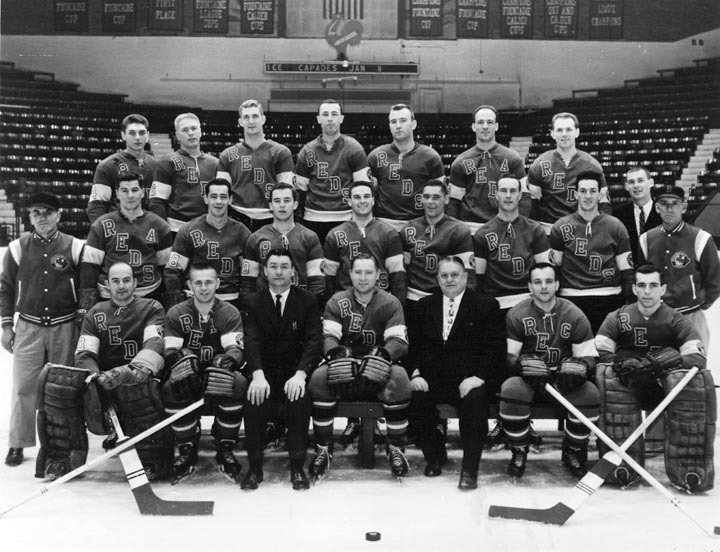 He moved on to the University of New Hampshire, where he majored in English and played four years of varsity hockey, elected by his teammates as co-captain and co-MVP in his senior year of 1959. He was hired by the Rhode Island Reds hockey club of the American Hockey League two months after receiving his bachelor’s degree from UNH. He spent five years as public relations director, then two as assistant general manager, and finally two more as general manager of the team. At age 29, he was the youngest GM in the AHL. In 1968, he left professional hockey to begin a 30-year career in marketing and public relations. At the same time, he coached youth hockey for more than 20 seasons. In 2000, he retired from marketing and became founding president of the Rhode Island Reds Heritage Society, a non-profit organization whose stated mission is to restore and preserve the glorious history of the Rhode Island Reds hockey club. Today, he is serving his 19th season as president. March 10: Writer and historical reenactor Paul Bourget on why the battles fought in 1864 were pivotal to the outcome of the American Civil War. The interactive and educational Museum of Work & Culture shares the stories of the men, women, and children who came to find a better life in Rhode Island’s mill towns in the late 19th- and 20th centuries. It recently received a Rhode Island Monthly Best of Rhode Island Award for its SensAbilities Saturdays all-ability program.